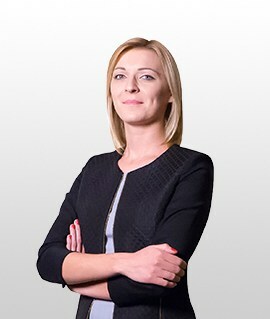 Agata Wołyniec is a Polish, qualified lawyer. She started working at a law firm during her studies and so, despite her young age, has several years of professional experience. In 2014 and 2015, she participated in the “Erasmus for Young Entrepreneurs” European Exchange Programme for Entrepreneurs in Italy. She has a wealth of experience in civil law, commercial disputes, debt collection and debt enforcement. She provides legal services and legal assistance to individuals and business entities, in particular, by providing legal advice, preparing legal opinions and representing clients in courts and public bodies as a legal representative. She has trial experience in civil cases, especially in cases connected with unpaid accounts. She works at the Boccadutri International Law Firm as a specialist advising Polish-speaking clients. She also focuses on forex cases, Ponzi schemes, claims for damages for personal injuries, immigration and family law. She has been a member of the Polish Council of Legal Advisers since 2014. She has been registered on the list of foreign lawyers in Italy (in Palermo) since 2016. She graduated from the Krakow Academy.